I remember well my first taste of a Limbertwig. It was a Myers’ Royal Limbertwig, a tree-ripened fruit picked fresh from a tree I had planted four years earlier. The apple was a little larger than most but, as I recall, not a particularly attractive specimen. It was a rather non-descript, yellow-skinned apple overlaid with a dull, dark red blush and was one of about a dozen apples hanging on the tree, the very first crop on this very young tree. The heavy fruit was warm in my hand. It was warmer-than-usual on that October afternoon and the heady fragrance of ripening apples permeated the air in the quiet shade of the orchard. The older Kinnaird’s Choice apple tree, growing alongside the Myers’ Royal, was hanging full with dark purple fruit which would be ready for harvest in the next week or two. On the other side of the Myers’ was our prized Summer Rambo, a personal favorite of ours which had been picked and turned into applesauce a month earlier. Scattered through the orchard were a few other late-season varieties – Winesap, Willow Twig, Arkansas Black – which would be gathered later that fall. Right now, my attention was focused on the Myers’ Royal in my hand. This was to be my first taste of a new apple, always an exciting moment. I sat down and made myself comfortable at the base of the Myers’ Royal tree. I vigorously rubbed the apple on the front of my shirt to bring out a bright, polished sheen. Holding the fruit close to my nose to savor the subtle green-apple fragrance, I took a deep, firm bite. I always prefer to bite into a whole apple rather than cut it into slices, as my wife likes to do. I want to enjoy the entire gustatory experience of eating an apple – the first crunchy bite; the initial burst of juice and flavor; the subtle aromas; the texture and chewability; the intriguing mix of sugars and acids which contribute to the tone and complexity of flavors. I take pleasure in the actual physical experience of eating a fresh apple much as a dedicated oenophile would appreciate a glass of the finest Cabernet. These sensory “inputs”, if you will, are critical elements which, for me, enhance the quality and joy of eating a fresh apple. As I sat quietly beneath the tree savoring that first bite, I was immediately taken by the unique combination of flavor and aroma which surprised and intrigued me. How do I describe what I was tasting? Here were flavors that I normally would not associate with fresh apples – a light, earthy, smoky, somewhat musky flavor that I sensed more as an aroma than an actual taste. Underlying these unusual flavors was a smooth, juicy sweetness, wonderfully counterbalanced with just the slightest hint of herbal spiciness that lingered on my tongue. So, this was the unique “Limbertwig flavor” I had read about before in several publications. I was duly impressed and quite pleased with this new apple! 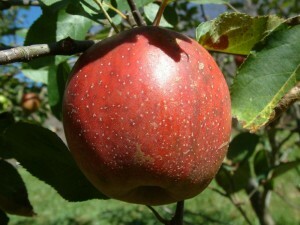 We describe Limbertwigs as the “quintessential” Southern Appalachian apple. 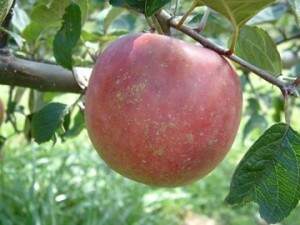 With just a few exceptions, most Limbertwig apples originated within an area encompassing northwestern North Carolina, eastern Tennessee, southwestern Virginia and southeastern Kentucky. There are more than 50 different strains of Limbertwig which have been described from this regional birthplace. Examples are the Fall and Brushy Mountain Limbertwig from North Carolina; Kentucky and Caney Fork Limbertwig from Kentucky; Myers’ Royal and Buladean Limbertwig from Tennessee; and Levering and Red Limbertwig from Virginia. The list of named Limbertwig varieties is almost dizzying: Victoria, Summer, Black, Royal, Red Royal, Swiss, Ramsey, Rocky River, Ruby, Ben Lomand and on and on…. A notable trait of Limbertwig trees is the characteristic weeping growth habit, a physical feature created by the thin, “limber” twigs and branches which becomes more pronounced late in the season when the tree hangs heavy with ripening fruit. The weeping growth is not common to all known Limbertwig varieties, so you cannot use that feature to identify a Limbertwig. To confirm whether an unknown apple is a true Limbertwig, you have to go by the taste, for it’s that unique, one-of-a-kind flavor that makes a Limbertwig… a Limbertwig! Any meaningful discussion of Limbertwig apples must acknowledge the diligent work of the late Henry Morton of Gatlinburg, Tennessee, who has to be recognized as the one individual most directly responsible for locating, propagating and restoring dozens of “lost” Limbertwig varieties. Morton was a Baptist preacher who dedicated his life to two personal missions – spreading the word of the Gospel and collecting and propagating “old timey” apples! Living on the outskirts of the Great Smoky Mountains National Park, he made dozens of forays into the interior of the Park, visiting old homes and farmsteads which had been abandoned generations earlier after the federal government had seized the properties for the creation of the National Park. The treasures he found there represented a significant part of our American history and heritage. 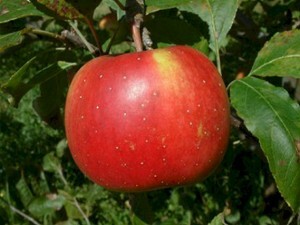 Henry was responsible for rescuing numerous varieties from the edge of extinction, including old American apples such as Sunday Sweet, Moyer’s Spice, Walker’s Pippin and Sweet Bough. But, it was his work with Limbertwig apples that solidified his reputation as an apple scholar and historian. Henry knew his Limbertwigs. It was he who first pointed out to me how Limbertwigs might vary in size, shape and color but they all have one distinguishing characteristic, and that is the distinctive Limbertwig flavor. It’s interesting that not everyone who eats a true Limbertwig can detect that unusual flavor and aroma. It’s all a matter of our individual palates, I suppose. I’m just grateful I am one of the fortunate who can. I never met Henry in-person but did have several phone conversations and corresponded frequently with him by “snail mail” in those days before email became the norm for personal communication. In fact, I still have a couple of original editions of Henry’s typewritten nursery catalog from 1985 in which he lists 45 different Limbertwigs. The very first trees we planted on our farm in 1986 were purchased from Henry and included Kinnaird’s Choice, Summer Rambo, Black Ben Davis, Early Harvest and, of course, my wonderful Myers’ Royal Limbertwig. Henry passed away unexpectedly in the late 80’s while working in his orchards. His legacy lives on in the trees still thriving in our orchards and in the backyards and home orchards of hundreds of other growers and lovers of apples everywhere. As an apple grower living amongst the high mountains of the Southern Appalachians, I continue to be amazed at the natural history and stunning diversity of flora and fauna in this region. 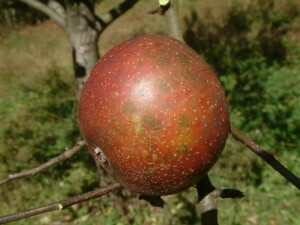 The origin story of the Limbertwig apple is a stellar example of this historic natural diversity. Long-time inhabitants who live in these venerable hills, whether residing in deep, remote mountain hollows or atop sweeping, open mountain ridges, love their Limbertwigs and embrace the lore and diversity associated with this Appalachian original. The Limbertwig is a child born of this land and, through their love and respect for this Appalachian classic, the mountain folk are forever able to retain a deeply personal and vital connection to this land and its people. And, you know, if you really think about it, there’s something very comforting with this thought. A wonderful read, as always, Ron. Thanks for sharing your thoughts on the Limbertwig family of apples. I’m trying to do my small part in planting as many Limbertwig varieties as I can find on my homestead here in the Allegheny mountains of southcentral Pa.